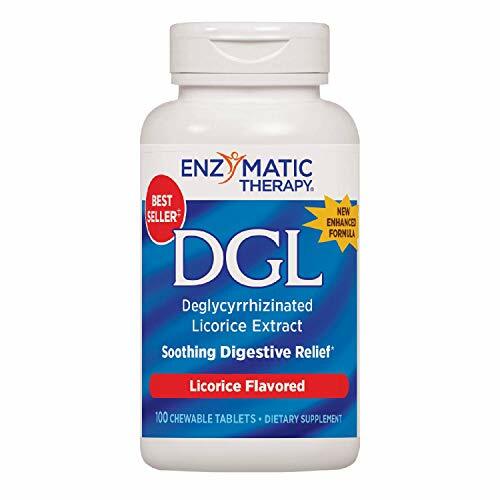 Enzymatic Therapy DGL, Licorice Flavor, 100 Chewable Tablets. Pack of 1 Bottle. Chewable licorice tablet for soothing relief of occasional stomach discomfort. 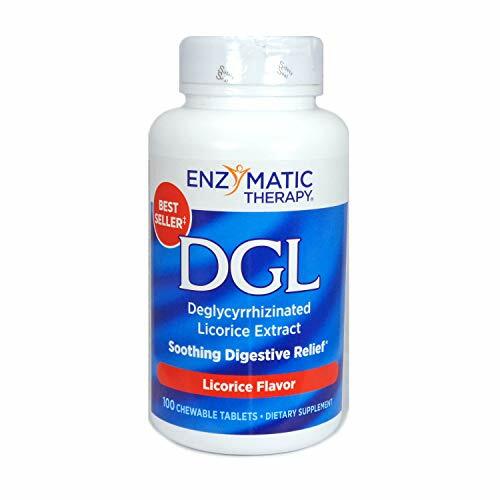 Soothing Digestive Relief: DGL extract, Soothes stomach lining, Enhanced formula with GutGard. Contains less than 1 percent glycyrrhizin to help avoid any potential effect on blood pressure. Supplement Facts: Serving Size: 3 Chewable Tablets. Calories: 10, Total Carbohydrate: 2 grams, Total Sugars: 1 gram (Includes 1 gram Added Sugars). Ingredients: Glycine 150 milligrams, Deglycyrrhizinated Licorice (DGL) Root Extract 75 milligrams. Other Ingredients: fructose, mannitol, sorbitol, stearic acid, natural flavor, cellulose, silicon dioxide, magnesium stearate. This product does not contain: artificial coloring, artificial flavoring, dairy products, gluten, preservatives, salt, soy, wheat, yeast. Directions: Chew 3 tablets after food in the morning. Chew 3 tablets after food in the evening. Notes: If pregnant, nursing or taking any medications, consult a healthcare professional before use. 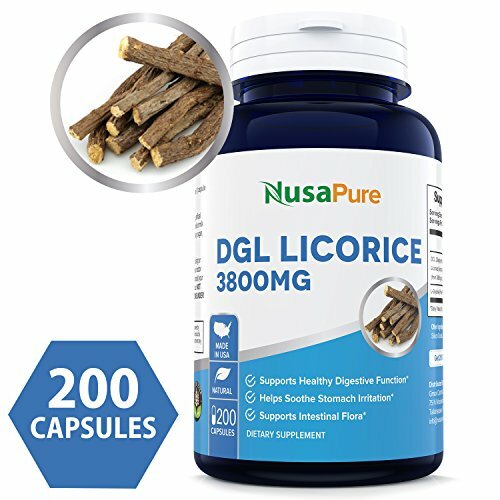 Natural Factors tasty Deglycyrrhizinated Licorice (DGL) is a safe and effective licorice extract. It is specially processed to have glycyrrhizin removed to avoid potential side effects such as elevated blood pressure. 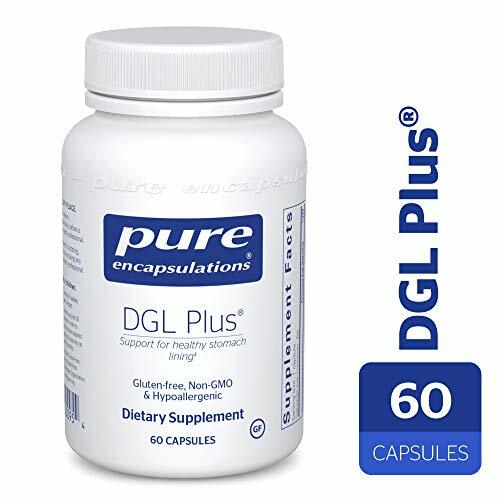 DGL improves the integrity of the natural mucus lining of the stomach and intestinal wall. it'stimulates the protective factors which guard against weaknesses in these linings. Enzymatic Therapy, DGL (Without Fructose), 100 Chewable Tablets. Pack of 2 Bottles. 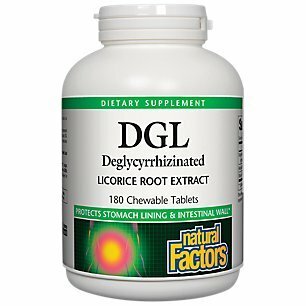 Chewable, NO sugar deglycyrrhizinated licorice (DGL) tablet. 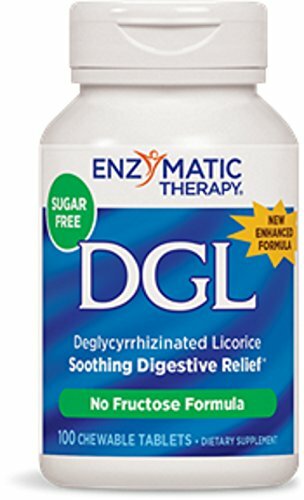 Why use a deglycyrrhizinated licorice (DGL) supplement: DGL extract, Soothes stomach lining, Enhanced formula with GutGard. Contains less than 1 percent glycyrrhizin to help avoid any potential effect on blood pressure. Supplement Facts: Serving Size: 3 Chewable Tablets. Calories: 5, Total Carbohydrate: 2 grams, Total Sugars: 0 gram (Includes 0 gram Added Sugars). Ingredients: Sugar Alcohol 1 gram, Glycine 150 milligrams, Deglycyrrhizinated Licorice (DGL) Root Extract 75 milligrams. Other Ingredients: sorbitol, mannitol, stearic acid, natural flavor, cellulose, silicon dioxide, magnesium stearate. This product does not contain: artificial coloring, artificial flavoring, dairy products, gluten, preservatives, salt, sugar, soy, wheat, yeast. Directions: Chew 3 tablets after food in the morning. Chew 3 tablets after food in the evening. Notes: If pregnant, nursing or taking any medications, consult a healthcare professional before use. Herbal supplement. Professional strength. Deglycyrrhizinated licorice. Supports a healthy stomach lining. Formulated by Michael Tierra L.Ac., O.M.D. Want more Dgl Licorice Chewable similar ideas? Try to explore these searches: Great Dane Zipper, Fish Roll Stickers, and Copper Drain Assembly.